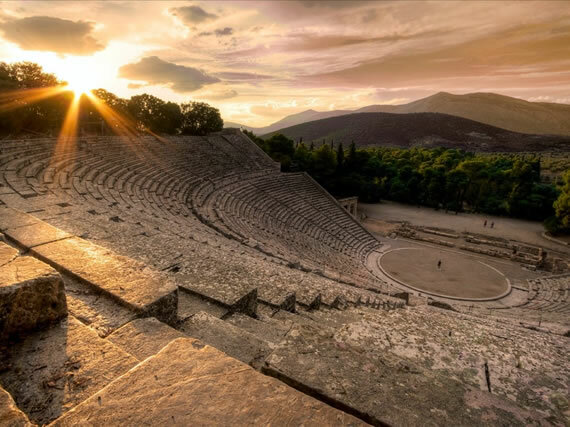 In Epidaurus, an area with an excellent climate & many health spas, stands the Sanctuary of Asklepios, one of the most famous healing centers in ancient Greece. The Sanctuary of Asklepios was founded (replaced an earlier) in 800 B.C. & it was dedicated to Apollo (known for his therapeutic abilities). During the 4th & 3rd centuries B.C. & due to continues wars, many people forced to seek the protection & help of Asklepios thus the sanctuary became a very rich centre. 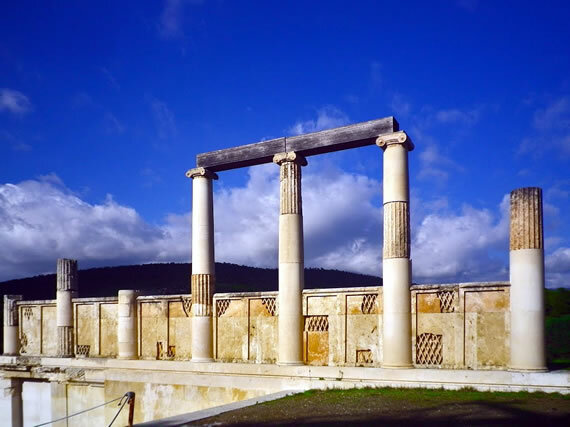 Several buildings were constructed, amongst them, the temple of Asklepios, the Abaton, the Tholos, the Theatre, the Stadium, the Altar of Apollo, the Great Stoa & the Temenos of the Muses. The Sanctuary suffered a lot of damages in 1st century B.C. because of the attacks made by Sulla & Cilician pirates, but it flourished again in mid of 2nd century A.D. under the guidance of Roman consular Antonine who financed the reconstruction of the damaged buildings. Despite the fact that Christianity did not allow the cult of ancient gods, the Sanctuary of Asklepios was known until mid of 5th century A.D. as a Christian treatment center. The most impressive monument to the visitor is the famous Ancient Theatre with its perfect acoustic & symmetrical proportions, as the historical & geographer Pausanias has mentioned since the second century A.D. The theatre was built in 340 – 330 B.C. & it hosted drama performances as well as music & drama competitions. The theatre’s capacity is 13.000 – 14.000 seats. 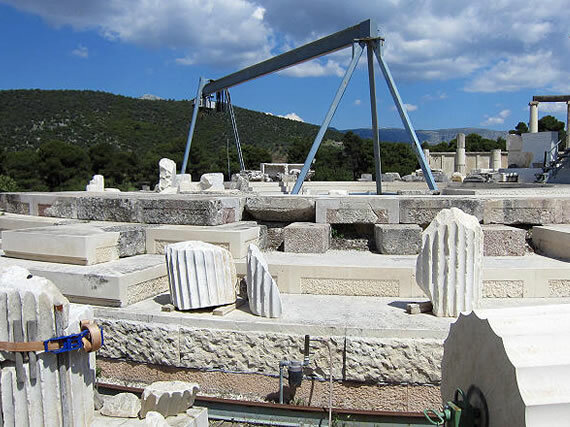 The orchestra has a circle shape with 20 meter diameter & in its center stands the base for the Dionysus altar, the Thymeli. The excellent harmony of the construction, based on a regular pantagonic shape, is the cause for its acoustic perfection. Since 1954, every summer the Epidaurian festival (mainly ancient drama) is taking place. Another monument in the area is the Stoa of Abaton where the treatment of patients was taking place. The building was constructed in two phases in 4th century B.C. Its façade had 31 Ionic columns. There, away from prying eyes, the patient expected the treatment which was achieved through the procedure of "egkoimisis". The patient, after being washed with water from the holly well, slept on the ground & "was in contact with the God". The God himself or through his holly animals appeared in patient’s dreams offered him suggestions for treatment. Being one of the more interesting features in the area, Tholos is considered as the most perfect circular construction of the ancient Greek architecture. It was constructed between 365 – 335 B.C. as a part of the big project of the Sanctuary of Asklepios. The building is characterized by its trilateral order. Under the floor of the building there was a three level basement. In accordance to mythology that "the God healed believers from the earth" this place was considered as the "underground home" of the God.